The 2016 Judith Granese $500 Scholarship winner. Aaron, a Key Club Lt. 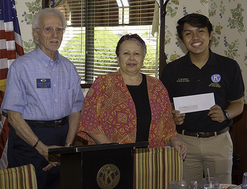 Governor, was selected for his academic achievements and Key Club activities.